With a very, no nonsense kind of style, the Strongman 7ft x 7ft Pentagon Shiplap Corner Summerhouse is a very interesting looking corner summer house. 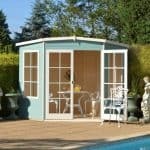 It has a great set of large double doors and two good sized windows that allow lots of natural light in the summerhouse. They have used half glazed windows and the framework on them is very impressive and helps give the summerhouse its somewhat unique and interesting look. 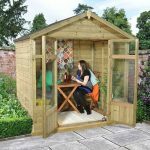 At 7 X 7, the summerhouse is the ideal size for those who want a fun place to relax in their garden, but do not have a whole lot of space. 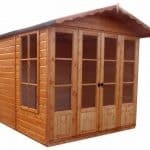 The summerhouse is built around a very robust frame that is a good thickness and made with high quality FSC timber. This frame is covered by thick tongue and groove shiplap cladding that has a very strong look to it. The flat pent roof is designed to force the rain to run off the back of the roof and away from the front. Felt and strong boarding is what makes up the roof. Tongue and groove boarding is what has been selected for the flooring and this as well as looking very appealing allows you to put heavy items inside. 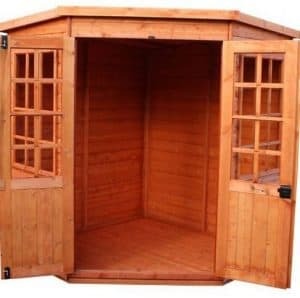 The Strongman 7ft x 7ft Pentagon Shiplap Corner Summerhouse is a very well made and fair priced corner summer house that is perfect for those who do not have a lot of space and do not want to spend over a grand. This is one very interesting looking summerhouse. It has a very strong look to it, hence the name Strongman. This is one of the most robust looking summerhouses that we have seen in quite a while. The style is something that really does grab your attention as it is quite unlike many of the other summerhouses that are out there. It is rather compact in its size as it is 6 feet 7 inches in both feet and width. This is bigger though than the pictures suggest and you can easily fit in a few chairs, a table and some other items as well. As is the case with most other corner summer houses, a flat pent style roof is used. We really like this roof and it is certainly one of the flattest we have seen, but it does slope towards the back so you will not have rain running down the front of the summerhouse. The roof is made with strong boarding and that is then covered by high quality roofing felt that will keep those boards nice and dry. The Strongman 7ft x 7ft Pentagon Shiplap Corner Summerhouse has some very impressive cladding. It is 12 mm tongue and groove shiplap cladding at it is put together so well that there is not a single nook or cranny that rain is going to get in through. We really like this cladding and feel that it does give this summerhouse a very interesting look. Connected to this cladding is a powerful frame that is 44 mm x 28 mm. This frame is going to keep the whole structure very strong and as you can see from the pictures. The frame does not actually stick out too far so it is not going to eat into your space all that much at all. We know that a frame is not the most exciting thing to discuss, but we can assure you, you are going to be very pleased that they put as much work into this frame as they did as it is going to be a major reason as to why you get 20 or more years of use out of it. We really love the way they have done the floor. The floor is made with tongue and groove shiplap boarding and it is so smooth that at a glance it looks like it just blends right into the walls as well as looking good under your feet. The flooring they have used is able to take a lot of weight and as it is made with thick tongue and groove boarding it will not feel bouncy or cheap like other boarding can. 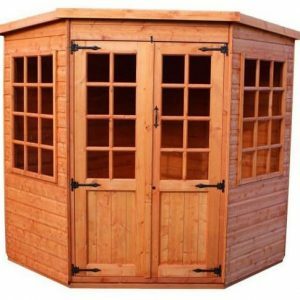 The Strongman 7ft x 7ft Pentagon Shiplap Corner Summerhouse is a great looking corner summer house and while it is structurally great. The wood will need to be treated shortly after construction and then once a year after this. This really is not all that much work and the fact you get a summerhouse that is going to last decades is well worth this little bit of work. No mention of the warranty is located anywhere on the page which is very, very frustrating. But most other summerhouses like this will give you at the very least a one year warranty. Just be sure to ask about it before you order as some warranties insist you have to treat the wood before you are covered by it. There is a great set of double doors on here that go very well with the strong design of the rest of the summerhouse. Some very attractive framing and half glazed windows make up the doors and then they have used these old style hinges and door handle which we feel really does just finish the door off in a perfect way. As they are double doors, you will not have any difficulty getting even larger items inside the summerhouse. There is even a turn catch at the very top which you can use to keep the doors swinging open in the wind if you do not want to lock them. Two large half glazed windows are on the sides and they have some fantastic framework. We really like these windows, but they are fixed so you cannot open them. Still the doors being able to open nice and wide does in a small way make up for this. But we must admit, we really would have liked for at least one of the windows to have been an opening window. The Strongman 7ft x 7ft Pentagon Shiplap Corner Summerhouse has strong double doors which have a high quality lock on them. This is great as it means you will feel more confident in keeping more expensive items inside the summerhouse. This is made with thick strong wood so it in general does offer you a lot of security. Add to this the fact the windows are fixed with a lot of framework and it really is going to be very hard for a thief to get in here. We are very happy with the level of privacy that this corner summer house offers. The intense framework on the windows means that it is not all that easy for a person to walk past and easily see what you have inside. The more we think about it the more we realise this is actually one of the more private summerhouses we have seen. No official customisation options are offered with this corner summerhouse, but there are different sizes of Strongman Pentagon Shiplap Corner Summerhouses out there. They can be purchased in 6 X 6 which is priced at £698.99, or 8 X 8 which is priced at £928.99. There are a few extras that are on offer for this summerhouse. First of all you can purchase a tub of 5 litre wood protector for £22.99. They have a Pro Shed Base for £49.99 which is for those of you who do not have a very flat surface to install the summerhouse on. A Security And Hasp Padlock set is a great way to add a bit more security and it is only £4.99. The last extra they have is a Gardman Solar Light which will cost you a reasonable, £16.99. This is a very well made corner summer house and one that has used the best materials they could at the price they are asking for it. Sure we would have liked opening windows, but apart from this, this is high quality through and through. You are going to get a lot of years of use out of this summerhouse. You will have to look after that wood, but the rest of the structure has been built to last. 7 X 7 is not huge, but it is actually a lot bigger than you would think. If you plan your things out just right then the space will go very far. To give you an idea of the space this offers, a couple of chairs, a table and even a shelf would easily fit in here. As long as you get a friend to help you out, you will find this a pretty straightforward installation service. No special tools are needed and even a couple of novice DIYers will have this installed in a few hours. The price they are asking is just fantastic. 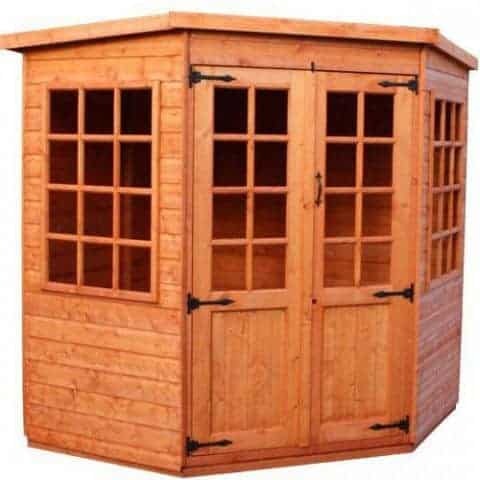 At under £800, you are getting a high quality summerhouse for your money that is going to last you a very long time. 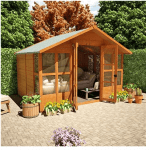 Final Thoughts: The Strongman 7ft x 7ft Pentagon Shiplap Corner Summerhouse is a high quality, fairly priced corner summer house that really has impressed us. 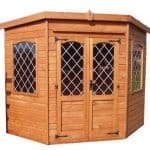 We are used to seeing corner summerhouses in the over £1000 range. So to see one that is this well made and at this price is just fantastic. 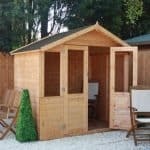 The size may not make it ideal for everyone, but those who are a little short on space or who just do not want to spend a fortune on a summerhouse are going to really love this. It may not be as fancy as some of the other summerhouses, but you can still have many years of fun with this.